A two point field goal and a three point field goal is one of the most common events that terminate a possession. A second method for terminating a possession is to make a free throw on the last attempt. On multiple free throw attempts, only the final free throw matters as the other team will take a made free throw out of bounds to throw back in to play. A defensive rebound also terminates possession. This is one of the other most common ways to terminate a possession. A turnover also terminate possession as a turnover explicitly indicates the ball has been given away to the opposing team. If time expires, then the possession expires. This is the rare time that a team terminates a possession without the defense obtaining the basketball. The reason we walk through this elementary definition of possession is due to the fact that offensive rebounds are commonly misunderstood as starting a new possession. In fact, the offense takes a shot and then recovers its own shot attempt. At no point does the offense relinquish control of the basketball. Therefore the shot clock rarely determines a possession and a possession maintains a maximum time limit of twelve minutes; the duration of a quarter of NBA play. Since every team plays within the same time frame, we then take a look at how possessions are maintained by teams. Using the above rule set for possessions and eliminating time expiration as rarely meaningful data is observed in those durations (dribbling out a clock or transitioning from a heaved shot if fractions of a second are on the clock), we found that there were approximately 178,200 possessions in the 2014-15 NBA season. Distribution of NBA Possessions (Offense and Defense Combined) for Every NBA Team During the 2014-15 NBA Season. We see from the 2014-15 NBA regular season that the Golden State Warriors played in the most possessions. Similarly, the Cleveland Cavaliers ranked closer to the bottom of the league. These totals include possessions played when the defense is on the court. As we can see, the number of possessions did not dictate if a team was better than another. Instead, we have to see how teams utilized their possessions. For instance, the Phoenix Suns of the 2000’s were notorious for running up the number of possessions per game. However, their tempo never translated to championships. Sure, if the team is fit and is able to execute every extra possession, they will be a title contending team. However, the offense is giving the other team extra possessions. And in these cases, if the team is just as fit and can execute just as well, then the style of play is negated. Due to this thinking, we would rather look at the effect of every possession. In order to do this, we want to merit a rewards system that gives teams credit for positive plays and takes away credit for negative plays. For instance, suppose a team on offense takes a shot that is missed and rebounded by the opponent. In scoring terms, this possession is a zero. The offense was unable to recover a rebound and loses the possession. How does it compare to a possession where a defensive player strips the ball from a point guard? Scoring-wise, the system is the same at zero. Similarly, if time expires and the offense dribbles out the clock, the score for that possession is zero. However in these three scenarios, three entirely different impacts have occurred. In the first case, the offense had an attempt to make a basket; the other two scenarios did not. In the second scenario, the defense made the play happen without a shot attempt. The other scenarios did not. So how do we make these adjustments? We start by building a rewards model. If a player gets a rebound, give them a point. If they get a steal, give them a point. So on and on. If a team makes a basket, give them the number of points for the field goal attempt. By doing this, we can identify teams that make plays happen rather than watching a team rebound go by. For this rewards model, we make the model offense-focused. That is, positive plays for the offense are positive points and negative plays for the offense are negative points. By inverting the possession of a given team (defensive players are negative players and offensive players are offensive), we can start identifying the impact of a player on the court. By using the inversion here, strong defensive players are given positive impact the same way a strong offensive player is given a positive impact. Here, each possession will effectively yield a number between -10 and 10. Typically scores are between -2 and 5 overall. For instance, a missed field goal rebounded by the opponent is a -2. A made three point basket off an assist is +5. In the first case, the defense is given a +2 score and in the second case, the defense is given a -5 score. Now if we record this for every possession, we can sum a pair of possessions to obtain a score over two possessions. For instance if a team misses a field goal and does not get the rebound, while in their next possession they hit a spot up three off a kick out; the scores as -2 + 5 for 3 points overall. It should be noted that the team with more rewards points is generally the winner. So how does this rewards model break down the 2014-15 NBA season? 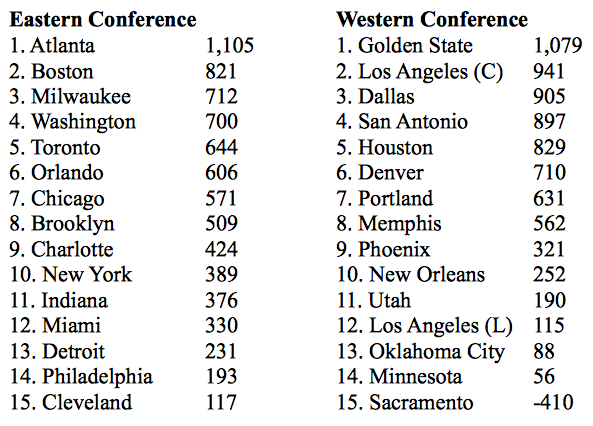 Cumulative Rewards for Every NBA Team from the 2014-15 NBA Regular Season. We see the top teams of the league gracing the top of this list. Seven of the Eastern Conference playoff teams are contained in the top eight of the Eastern Conference. 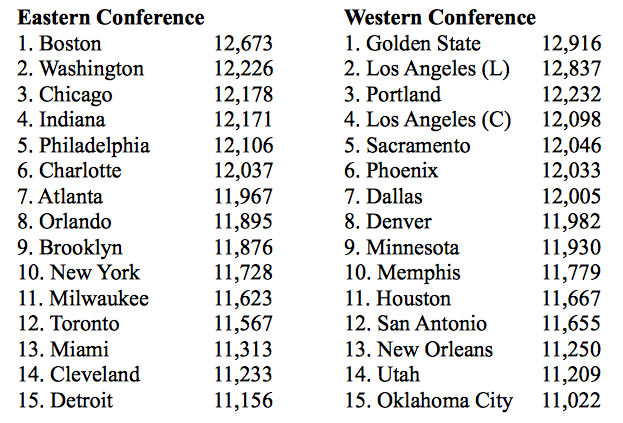 Similarly, seven of the Western Conference playoff teams are contained in the top eight of the Western Conference. The two missing teams are the Cleveland Cavaliers and the New Orleans Pelicans. Let’s take a look at Cleveland. The Cavaliers averaged 103.1 points per game while giving up 98.7 points per game, good for 4.4 points per game differential; second best in the East to Atlanta’s 5.4 point per game differential. However, the Cavaliers are in the bottom half of the league in blocks (26th), defensive rebounds (21st), free throw percentages (17th), steals (19th), and field goal attempts (23rd). These statistics drives the rewards system down for the Cavaliers, however the Cavs are second in three point attempts, and a top ten team in Field Goal Percentage and Assists. These specific categories and rewards indicate that the Cavalier are a premier shooting team, a mediocre defensive team, and a below average blue-collar team. In fact, scaling for defensive points per possession, the 98.7 points given up per game (8th best in East) translates to 0.7205 points given up per offensive-defensive possession; compared to Philadelphia’s 0.6841 and Boston’s 0.6548 points per offensive-defensive possessions shows that the Cavaliers’ defense is well… cavalier. In fact, the Cavaliers are second to last in the East (only Detroit is worse with a 0.7314). This further shows that Cleveland is indeed one of the best shooting teams in the league. Distribution of Rewards Model for All Possessions for the Cleveland Cavaliers over the 2014-15 NBA Season. On the other end of the spectrum, if the Golden State Warriors led the league in possessions, led the league in total positive actions per possession, and led the league in average positive interactions per possession (0.0835). Comparison of the Rewards Model Distribution for the Cleveland Cavaliers (Top) agains the Golden State Warriors (Bottom) for the 2014-15 NBA Regular Season. The comparison of the Warriors and the Cavaliers look fairly close to the same. However, taking a closer look at the numbers, the Warriors have double the amount of 6-Reward Point possessions than the Cavaliers (27 to 13). Similarly the Warriors have 47 more 5-Point possessions, 189 more 4-Point possessions (632 to 443). Similarly, the Cavaliers have more negative point possessions for -6-Points (13 to 7); for -5-Points (172 to 167) and -4-Points (544 to 518). Recall too that the Warriors maintain nearly 1,700 more possessions played than the Cavaliers. We can also use this rewards model for comparing players. Taking into account players playing in every possession, we obtain a weight average reward-points per possession. Computing this for the entire 492 player 2014-15 NBA Season, we find that the NBA season MVP (Stephen Curry) is contained in the top of the list. That’s a good sign. 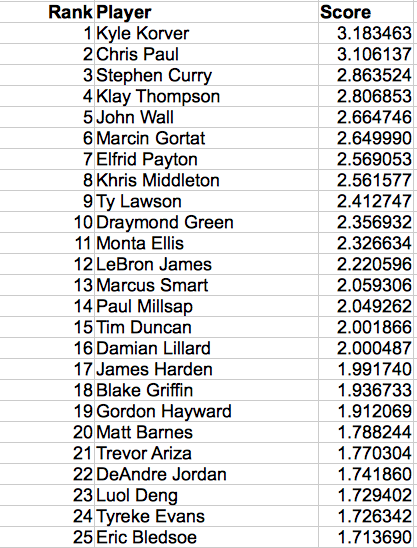 Top 25 Expected Rewards Points per Possession for all 492 NBA Players in the 2014-15 NBA Regular Season Sorted by Highest to Lowest Expectation. We find that Kyle Korver tops the list due to two main factors: three’s and team defense. Korver’s appearance is heavily bolstered by the 97.1 points per game (0.6653; second best in the East) along with his league leading ridiculous 49.2% three point field goal percentage (221 of 449). Chris Paul also ranks high on the list as he is a high ranking player in several categories: 18th in scoring, 31st in FG%, 23rd in 3P%, 1st in assists, 1st in assists to turnover ratio, 2nd in steals. Stephen Curry was in the similar status, however the primary separation between Curry and Paul is that Curry had a better supporting cast of Klay Thompson and Draymond Green. Sure Blake Griffin is another high caliber player alongside Chris Paul, but when weighting the scores, we take into account an important fact: The weights are developed by a multinomial regression based on 5 offensive players and 5 defensive players with the inverted score. This means if a team is successful when a player is on the court and not as successful when the player is off the court in place of a replacement player; that player’s value goes up. This identifies the player as a key contributor. In fact, the entire top-25 is littered with players from playoff teams. There’s no surprise to this. A further nice artifact of the multinomial regression is that the score is weighted by the number of possessions played, so the players can be compared from team to team and year to year. This is purely a pure possession score. Later, we will take a look at the rewards model and see how players compare from year to year and use that year to year knowledge to build a prediction for quality of teams for this upcoming NBA season.